Mother: Umm Abdullah, the daughter of Imam Hasan (a.s.). Kunniyat (Patronymic): Abu Ja'far. Peace be on you, O Imam of Sound advice! Peace be on you, O moon in Darkness ! Peace be on you, O shelter Of piety! Peace be on you, O leader of Pious ones! Peace be on you, O revealer Of the knowledge of Prophets! Peace be on you, O prestige Of the skies & the earths! Send the Choicest blessings on him-blessings sent by You On the descendants of Your Prophets and on Your select Beings & on Your Apostles and on Your trustees. ASSALAAMO A�LAYKA YA IMAAMUL HODAA..
ASSALAAMO A�LAYKA YAA KAHFAT TOQAA.. LE WAHYEKA FASALLE ALAIHE AFZALA MAA SALLAYYTA..
A�LA AHADIM MIN ZURRIYATE AMBEYAAEKA WA ASFEYAAEKA..
WA ROSOLEKA WA OMANAAEKA YAA RABBAL A�ALAMEEN ..
and the superbly selected from among Your servants. Born on the 1st of Rajab 57 years after Hijrah, Imam Muhammad al-Baqir was a mere four years old when the tragedy of Kerbala took place. He was also there to witness the murder of his grandfather and all of his other male relatives. His time however would see great changes in the empire of Islam with one ruling dynasty falling to another. During his period, the Umayyah empire was poised to crumble, however an even more ruthless group of individuals were waiting for their chance to rule � the Abbasides. During this battle for power, the Ahlul Bayt were given relative freedom and it is for this reason that the first thing that the Imams began to do was to reacquaint the people with the pure teachings of the faith. In addition, the rulers had seen the position of the 4th Imam and his busyness in prayers and supplications and felt that after the event of Kerbala, the Ahlul Bayt would remain �quiet�. On the contrary, the Ahlul Bayt continued their Jihad, however not by the sword � rather, by the pen. The 5th Imam in particular initiated the sessions of imparting knowledge in a wide variety of fields to the Muslims of Madina � right inside the Masjid of his grandfather, the Messenger of Allah! It was also during this golden era of learning that hundreds of books were written compiling the Islamic traditions of the Prophet and his chosen successors. The world shone on the birthday of the pure Ima`m (Mohammed al-Ba`qir). The Prophet, may Allah bless him and his family, had given good news to him before his birth. The members of the House (ahl al-Bayt), peace be on them, waited for him impatiently. That is because he was among the Ima`ms of Moslems. Namely the Prophet, may Allah bless him and his family, nominated those Ima`ms. This is the most famous nick-name of his. He and his son, Ima`m al-Sa`diq, were given the nick-name of al-Ba`qirayn (the two ones who split open knowledge). They were also given the nick-name of al-Sa`diqayn (the two truthful ones). ( Shaykh al-Turayhi, Jami'al-Maqal). The historians and the biographers of the Ima`m have unanimously agreed on that he was given the nick-name of al-Ba`qir because he split open knowledge. Namely, he studied knowledge in detail. Thus, he understood its origin and its hidden (branches). ( Ayun al-Akhbar wa Funun al-Athar, p. 213. 'Umdat al-Talib, p. 183). "O (you) who split open knowledge (making it available) to the people of piety and the best of those who seek to answer the call of the Exalted. ( Jawhart al-Kalam fi Madh al-Sada al--A'lam, p. 133). It is as if that the people called him al-Ba`qir because of his great knowledge and his many sciences. It was also said that he was given the nick-name of al-Ba`qir because of his many prostrations (in worship). Thus, he split open his forehead. (Mir'at al-Zaman fi Tawarikh al-A'yan, vol. 5, p. 78). "The truth called me for help after the untruth had gathered it in its abdomen. So, I split open its flank and brought out the truth from its hiding, so it appeared and spread after it had been hidden. (Mir'at al-Zaman fi Tawarikh al-A'yan, vol. 5, p. 78). 3. Taj al-Din b. Mohammed, the head of Aleppo , reported on the authority of Ima`m Mohammed al-Ba`qir, who said: "I came to Ja`bir b. 'Abd Allah and greeted him. He said to me: 'Who are you?' That was after he had become blind. I said to him: 'Mohammed b. 'Ali b. al-Husayn.' He said: 'May my father and mother be ransom for you, come nearer to me.' I came nearer to him. He kissed my hand, and then he stooped down to my foot to kiss it. However, I pulled it from him. Then he said: 'The Apostle of Allah, may Allah bless him and his family, recites his greeting to you.' 'Peace and Allah's mercy and blessings be on the Apostle of Allah,' I said. 'How is that, Ja`bir?' He said:'One day I was with him when he said to me: 'Perhaps you will live until you meet one of my descendants called Mohammed b. 'Ali b. al-Husayn on whom Allah will bestow light and wisdom. Then recite to him my greetigs. life. He did not leave it for another city. In it, he was the first teacher and great pioneer for scientific cultural movements. He used the Prophetic Mosque as school for him. There he gave his lectures to his students. Ima`m Abu` Ja'far (al-Ba`qir), peace be on him, had carried out his immortal message: he had spread knowledge and Islamic manners among people. Then Allah chose him to be His neighbor. He wanted him to enjoy the shade of His mercy and His gardens. He wanted him to be happy through meeting his grandfathers, who passed the methods of justice and fairness in the earth. The Imam announced his own Death. The Ima`m felt the approach of his certain death. So, he hurried to his aunt, Fa`tima daughter of Ima`m al-Husayn, peace be on him. He announced his death to her, saying: "I have completed fifty-eight years.(1. Tadhkirat al-Khawas, p. 350. In Kashf al-Ghumma, vol. 2, p. 322, it has been reported on the authority of Imam Ja'far al-Sadiq, peace be on him, who said: [ My father Mohammed al-Baqir, peace be upon him, said] " Ali was killed at the age of fifty-eight, 'Ali b. al-Husayn died at the age fifty-eight. I am fifty-eight years old.). Fa`tima understood what the Ima`m meant. Her heart melted with sorrows for her nephew. For he was the rest of the members of his family, who were killed by the swords of aggression and error. The Ima`m completed fifty-eighty years full of misfortunes. Those years filled his heart with sorrow and sadness. His father, Ima`m Zayn al-'Abidin, and his grand father, Ima`m al-Hasan, peace be on them, departed life at the same age. Thus, the Ima`m felt that he was about to die. This means that Ibra`him helped other persons to murder the Ima`m, peace be on him. These are some of the views mentioned concerning murdering the Ima`m, peace be on him, with poison. Ima`m Abu` Ja'far (al-Ba`qir), peace be on him, had the highest character in the Islamic world. Moslems have unanimously greed on his high character. They have admitted his outstanding merits. All Moslem religious scholars from all Moslem countries came to him to learn his sciences and his morals. For the Ima`m learned that from his grandfather, Allah's Apostle, may Allah bless him and his family. Allah bless him and his family. Hence, the Ima`m's high social rank displeased the Umayyads. Accordingly, they decided to murder him to get rid of him. A. The Ima`m exceeded the Umayyads and others in shooting. That was when Hisha`m summoned the Ima`m to compete with the Umayyds and others for shooting. Hisha`m thought the Ima`m would fail in hitting the target. Thus, he would be able to use the Ima`m's failure as means to degrade the importance of the Ima`m and to mock him before the Syrians. However, the Ima`m shot and hit the target several times. The people had never seen such skillfulness in the world of shooting. Hisha`m was full of anger. So, he decided to murder the Ima`m from that moment. B. The Ima`m debated with Hisha`m on the affairs of the Ima`mate. The Ima`m defeated Hisha`m. So, the latter was full of malice towards the former. C. The Ima`m debated with the scholar of the Christians on certain affairs. The Ima`m also defeated the scholar. So, the Syrians were busy talking about the Ima`m's victory over the Christian scholar. We have mentioned these matters in detail in the previous chapters. Ima`m Abu` Ja'far (al-Ba`qir), peace be on him, designated his son al-Sa`diq, peace be on him, as an Ima`m. For al-Sa`diq was the pride of the world. He was the pioneer of culture and science in Islam. His father designated him to be an Ima`m and successor and general authority for the community after him. He said to his followers that it was incumbent on them to follow and obey his son. 3. He endowed some of his money to some female weepers to weep for him for ten years at Mina. (Bihar al-Anwar, vol. 11, p. 62). The reason for that is that Mina was the greatest center where Moslems gathered, and that there were many female weepers at it. This would make the Moslems ask about the reason for weeping. They would be told that the Umayyads persecuted and killed Ima`m Abu` Ja'far (al-Ba`qir), peace be on him. So, the Umayyad would be unable to hide the murder of the Ima`m. As for the text of his testamentary enjoinments, it was reported by Ima`m Abu` 'Abd Allah al-Sa`diq, peace be on him, who said: [When my father was near to death, he said (to me): "Call witnesses for me." I summoned four men from Quraysh, among them Na`fi', retainer of 'Abd Allah b. 'Umar. (My father said:) "Write this testimony which I bequeath (like) Jacob did to his sons: My sons, Allah has chosen the religion for you. So, do not die except as Moslems. Mohammed b. 'Ali makes this last testimony to Ja'far b. Mohammed. He orders him to shroud him in his cloak in which he used to perform the Friday prayer, to put his turban on him, to make his grave a square, to raise it the height of four fingers above the ground, and to take his shabby clothes away from him at his burial. Then he said to the witnesses: "Depart, may Allah have mercy on you. You"Father," I said to him (after they had gone), "what was in this that there had to be witnesses for it?" "My son," he answered, "I was unwilling for you to be overcome and for it to be said that no testimony had been mad for him. I wanted you to have proof. The poison acted quickly on the body of Ima`m Abu` Ja'far (al-Ba`qir), peace be on him. So, death approached fast. During his last hours, he gathered all his feelings and sentiments, and cleaved to Allah, the Most High. He began reciting the Holy Koran. He asked Allah's forgiveness. While his tongue busy praising Allah, death came to him. So, his great matchless soul ascended to its Creator after it had enlightened the cultural scientific life in Islam. When the Ima`m died, the most wonderful stage of the Islamic message, which provided the Islamic community with the elements of awareness, development, and prosper, ended. Ima`m al-Sa`diq, peace be on him, prepared the holy body for burial. He washed it and shrouded it. He was weeping bitter tears for the missing of his father, who was the best person under the sky in knowledge, outstanding merits, and devoutness. The people carried the great body from al-Hamima. They gathered around it. They were shouting: "There is no god but Allah! Allah is Great!" They were greatly moved to touch the coffin of the Ima`m. They were mentioning the laudable and favors of Ima`m Abu Ja'far (al-Ba`qir), peace be on him. Then they reached at Baqi' al-Gharqad. They dug a grave alongside the grave of his father, Zayn al-'Abidin, the greatest Ima`m, peace be on him, and besides his great-uncle, Ima`m al-Hasan, the Lord of the Youth of Heaven, peace be on him. Then Ima`m al-Sa`diq buried his father in his final resting place. He buried with him knowledge, clemency, and kindness to people. 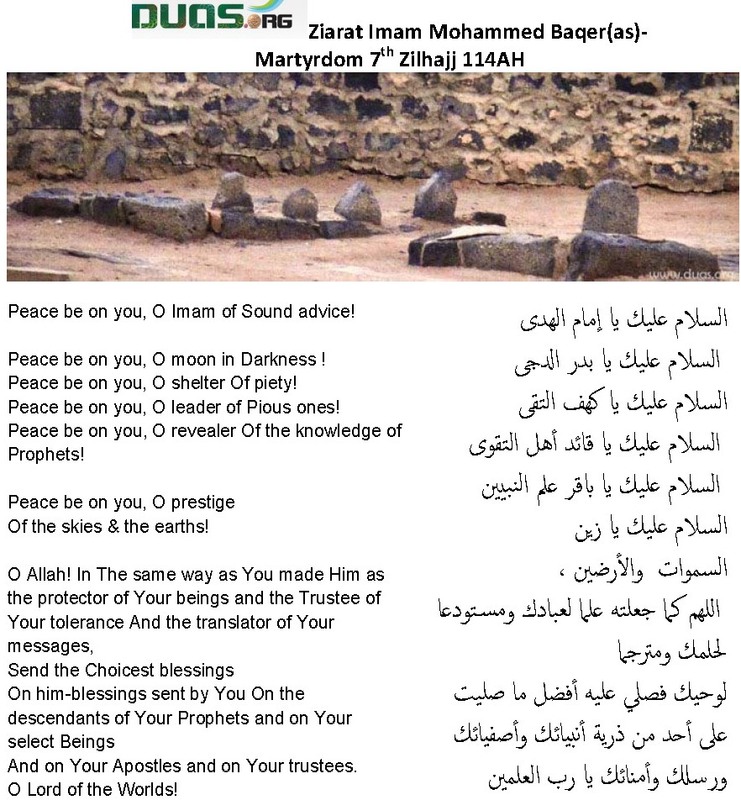 The martyrdom of Ima`m Abu` Ja'far (al-Ba`qir), peace be on him, was the greatest loss for the Muslims then. For they missed the leader, the pioneer, and the guide, who spared no effort to spread knowledge and cultural awareness among Moslems. The Holy Ima`m, peace be on him, was martyred at the age of 58. It is famous that Ima`m al-Ba`qir, peace be on him, died in the year 114A.H. 'To Allah we belong and to Him is our return. By Allah, the one who used to say: 'Allah's Apostle, may Allah bless him and his family, said,' has passed away. He was not asked about what was between him and Allah's Apostle, may Allah bless him and his family. I have never seen the like of him." Ima`m al-Sa`diq, peace be on him, took his traditions from his fathers, who took their sciences from their grandfather, Allah's Apostle, may Allah bless him and his family.